Well to show you that I'm not always tidy I have a few bits out today!! Been making the card thats on the post before this. The green box is my scraps box & I'm happy I made the card with all scraps yey! On face book they're doing a retro week. 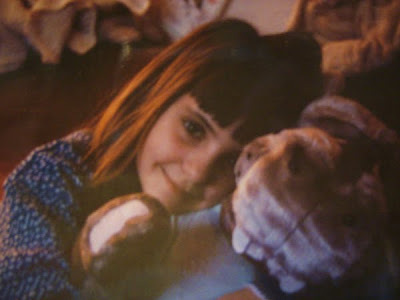 You have to change your profile pic to what you looked like when you were younger so I thought I'd share on here too! If you would like to join in with WOYWDW then pop over to Julia's blog & leave a comment & we'll all come & have a snoop about your work space!! Ah weren't you cute ;) The card on prev post is lovely :) Ooh I couldn't craft on a sofa that colour without throwing something over it first :-/ I get ink everywhere! I need to be careful if I use any ink or pens today 'cos I've got a cardi on with droopy sleeves. Aw. Lovely photo of a little you. Your craft stash looks very organised. Thanks for dropping in on my blog. Yes I'm happy to make my pictures to sell. The charge depends on the hours spent and the materials required so they all vary in price. If you have something particular in mind let me know and I will do my best. You will be pleased to know that I read it in a silly game show voice too :0) How cute were you????? I don't think. technically that having a handful of boxes on the floor counts as untidy! If you should ever find yourself visitng me, I advise you brace yourself!! Am so impressed by the stuff you make on the sanctuary of your sofa. And weren't you cute! Bet your Mum loves that pic. Bet your Mum loves that pic...you were a sweetie! 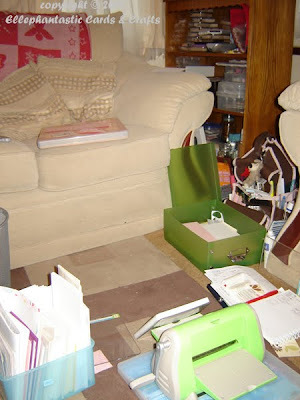 I'm not sure that you have grasped the understanding of the word 'untidy' - I don't think your sofa craft sanctuary is at all untidy..it looks organised to me. If you ever find yourself on my doorstep, you may need to be prepared to learn...! Your crafting area always looks so cosy Helen. LOL @ Julia.... you are deffo not untidy, in boxes is very tidy! ooh the sight of your cuttlebug on the floor made my knees twinge -wouldn't be able to get up again if I crafted like that tee hee! I'm sorry, this is all a bit too tidy for me... if I couldn't shut the door on my mess, I think I'd be headed for the divorce courts.... I never show the really bad bits... maybe nest week! I love your workspace. Looks warmer than mine! You have a lovely blog & your cards are all gorgeous. Thanks for stopping by my blog. :) Ooh you are so lucky living in York. Have a great weekend. Gez.